Ninja Theory's dark action-adventure Hellblade: Senua's Sacrifice might be coming to the Xbox One, according to a leak that was posted on Reddit. 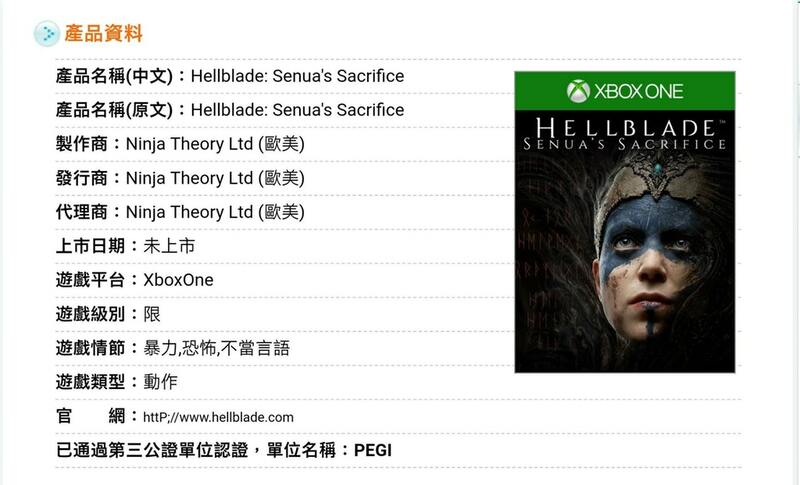 The image, posted by a user named kokokko416, shows Hellblade listed for the Xbox One on a Taiwanese game software rating regulations website, complete with Xbox boxart and all. The released date is "unlisted." While no official announcement has been made, the same website has accidentally outed games previously in the past. Currently, Hellblade is only available for PlayStation 4 and PC. Hellblade was received very well by critics and gamers alike when it released in August 2017. The title has a dark story as it deals with the main character's mental illness and the struggle that comes with it. It would be a big get for Xbox if this listing turned out to be true, as any loss of a console exclusive for PlayStation would be a win for Microsoft, and vice versa.